Open Fire is a searing State of the Union message for the end of the Republican era. 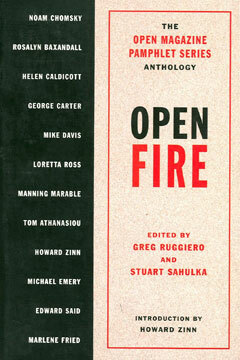 This anthology gathers the best, most timely writing from the rogue Open Magazine Pamphlet Series, published by Greg Ruggiero and Stuart Sahulka. In its first two years of existence, the Pamphlet Series has set a new standard for radical journalism, with incisive essays by leading commentators on Desert Storm, the civil unrest in Los Angeles, the huge pro-choice rally in Washington, D.C., global warming, and other burning issues. By promptly confronting the unreported consequences of U.S. foreign and domestic policy, the series developed a reputation as an important counterbalance to political events as portrayed by the White House, the Pentagon, and the national media. Compared by the Village Voice to the efforts of Thomas Paine and Martin Luther, these dissident speeches, lectures, and essays open fire on government “nunspeak,” media “infotainment,” and the policies behind them. Greg Ruggiero was born in Brooklyn, New York, in 1964. He is co-founder of the Open Magazine Pamphlet Series and author of the pamphlet Seizing the Media. Stuart Sahulka was born in Rahway, New Jersey, in 1965. He is co-founder of the Open Magazine Pamphlet Series and author of the play The Poet.